Unfortunately, the next step in this expose takes us to truly bizarre and disturbing places. A particularly disturbing child abuse case involving a military day care center came to light in 1987 43, NEW YORK TIMES. Allegations of abuse involving 60 children, some infants, surfaced at the Presidio military base in San Francisco. I would like to point out that this article claims that child abuse allegations had surfaced at more than 30(!!!) 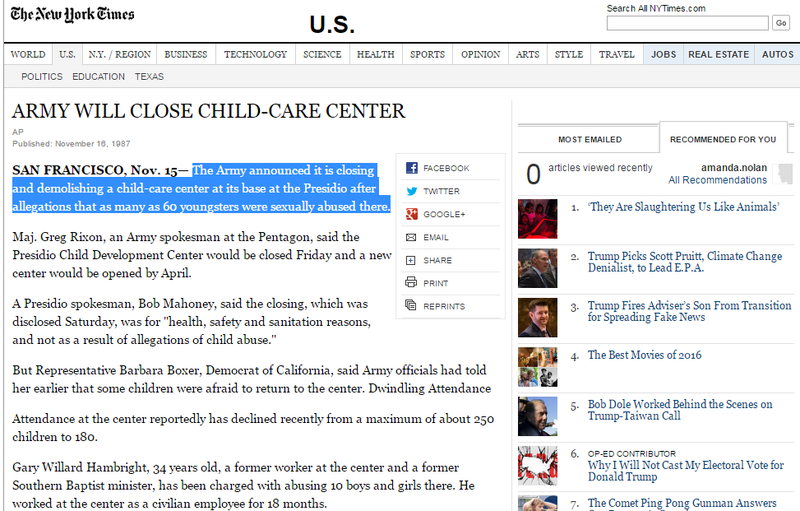 military day care centers across the country in the previous 3(!!!!) years before its publishing, including some of the most esteemed bases such as West Point and Fort Dix. It would be impossible to lay out the cases for each one here, but I would like to share this quote from the San Jose Mercury News: “Children at West Point told stories that would become horrifyingly familiar. They said they had been ritually abused. They said they had had excrement smeared on their bodies and been forced to eat feces and drink urine. They said they were taken away from the day care center and photographed. “ . At the Presidio, at least 4 children were found to have chlamydia, and up to 60 had shown clear signs of abuse. The most important exposes into the Presidio case were written by Linda Goldston of the San Jose Mercury News. In an article titled 44, “Abuse Case at Presidio Quietly Closed By U.S.”, the events are told in chilling detail. This story was my cue to understand that the whole system is rigged, and the people at the top are all corrupt and protect their own.